Traditional marker clustering approaches for maps are a little crude, really. 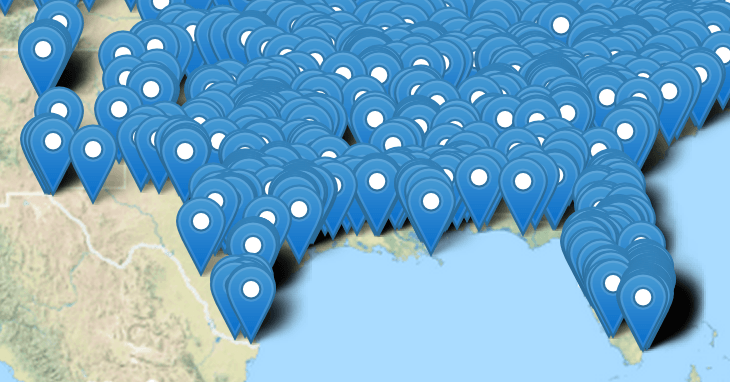 Based only on proximity, these maps suffer from bloated cluster outlines with meaningless population counts. Plus it adds spreadsheet-like aggregations. The same data, with traditional clustering added. Markers are now being grouped into clusters you can drill into. Which is great! But without region-awareness population outlines randomly cut across states, rendering the counts meaningless. Furthermore the outlines are bloated and suggest markers exists in areas that are clearly not populated. Clustering the way it should be. One cluster and one count per state. That blue coverage outline reveals the real extent of the Texas marker population footprint, which is much more informative than the Texas state border (shown in white). 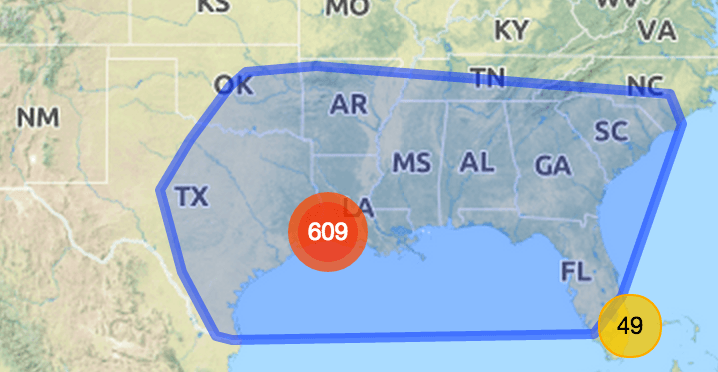 And you don't have to enter any GeoJSON or WKT to achieve this! The plugin takes region-awareness to the next level through in-situ analysis of key performance indicators. 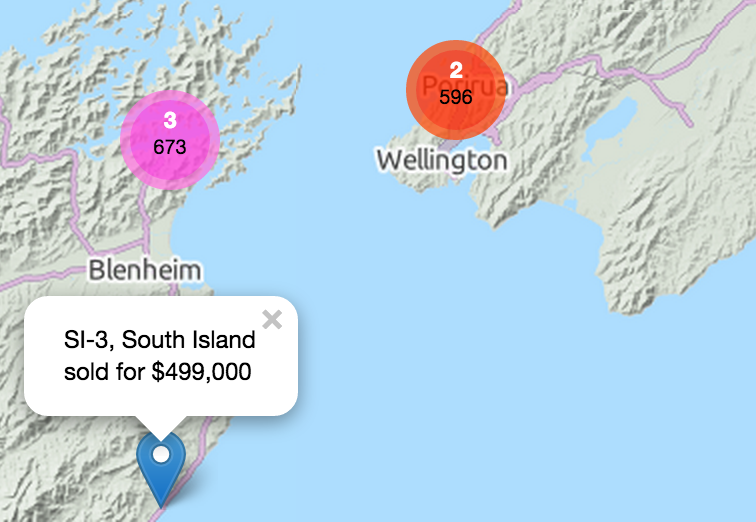 If your markers represent locations of, say, real estate sales, select Average from one of the available aggregation functions and each cluster will not only display its population count, but also the average sale price across its region. Cluster colours reflect the price ranges you defined. Thus medium-priced regions are immediately distinguishable from high-priced regions, at any zoom level. The RegionBound plugin is based on a a fork of danzel's popular Leaflet.markercluster code. If you already use it, simply replace leaflet.markercluster.min.js by the new .js file (renamed) from the package download for an instant upgrade. Drupal users: no need to rename, just drop it in the same folder. Or start afresh and create beautiful maps using Leaflet. Your purchase gives you a leg-up with its complete examples that work out of the box. Drupal (D7) users have it so easy. No coding required. Enable the RegionBound plugin with module IP Geolocation Views & Maps and all you have to do is fill out the module's map configuration form. Your copy is for a single hostname plus any subdomains as well as localhost. After you have submitted your payment, please wait several seconds for the page to refresh while the plugin is being emailed to you. You should receive receipt and plugin + documentation in two emails. Check your spam folder, if you only see one email. Are you ready to go RegionBound? 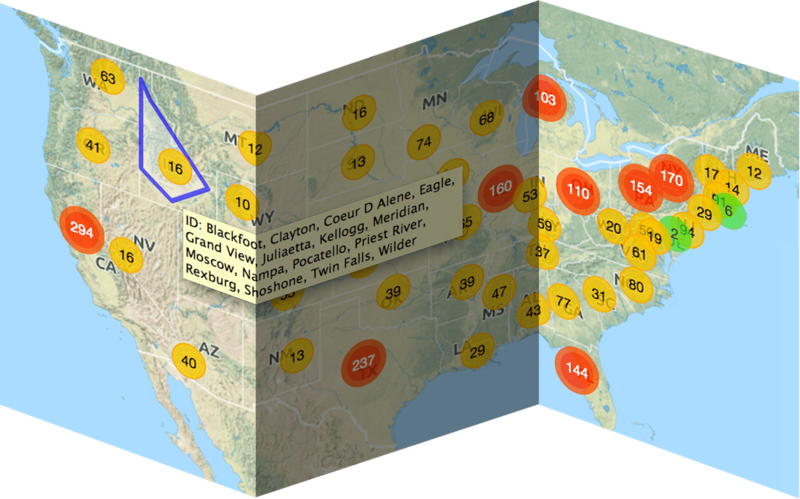 Maps with marker clusters can get a user to location-specific data faster than using menus or search boxes. Clusters have just come of age with RegionBound. With its region-awareness and "tight coverage" suddenly your data is greatly more relevant and meaningful at the glimpse of an eye. Now we're using RegionBound clustering, I couldn't imagine going back. Once you've tried RegionBound, traditional marker clustering no longer makes sense. 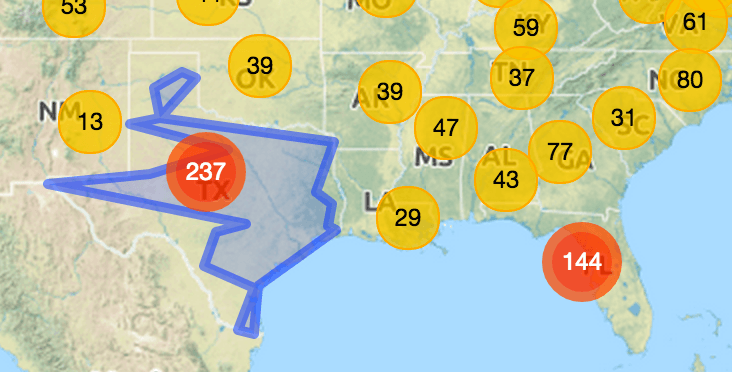 RegionBound brings smarter clustering and data aggregation to your maps. Once you have used it for the first time, you just know that this is a must-have on every map on any website.